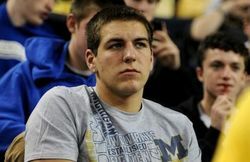 Posted on Fri, Mar 30, 2012 : 8:32 a.m.
Michigan basketball recruits Mitch McGary and Glenn Robinson III are among 40 high school players who'll participate at the All-American Championship. The games will be played at the Lakefront Arena in New Orleans on Sunday. McGary and the North team take on the South squad at 3 p.m., followed by the East vs. West game at 4:30 p.m. Both games will be carried live on ESPN3.com and rebroadcast in prime time on ESPNU at 9 p.m. Sunday.